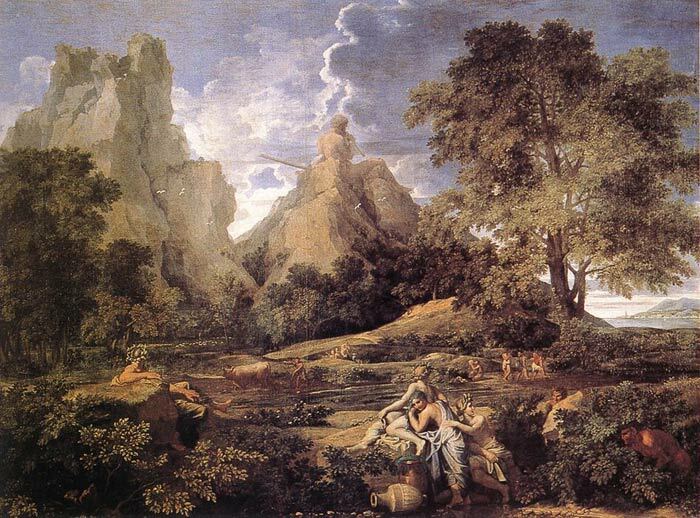 Landscape with Polyphemus marks the beginning of Poussin's final period, that in which poetry rises to an all-embracing feeling for the world - still, however, interpreted through a mythological guise. The subject for the Landscape with Polyphemus was borrowed from "Metamorphoses" by Ovid. A terrible one-eyed giant Polyphemus anamoured of nymph Galathea is singing of his love on a pipe. SPECIAL NOTE : The painter will make the reproduction as close to the original oil painting as possible. If you want your painting to alter from this likeness, please email us and " Landscape with Polyphemus " will be reproduced according to your special requirements.